In My Jewish Year: 18 Holidays, One Wondering Jew, Abigail Pogrebin takes readers on a journey through every single Jewish holiday ever. 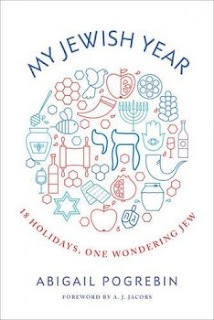 As a non-Orthodox Jew, many of these holidays were unfamiliar to her before this; she explains these holidays and finds meaning in them at the same time. Abigail last appeared on The Book of Life in October 2006, talking about her book Stars of David: Prominent Jews Talk About Being Jewish. I spoke to Abigail by Skype at her home in New York.